In my typical bungling-along style, Jon and I eventually succeeded in climbing most(6p) of the amazing Supercave/ Ellen Pea route, Located on an obscure 1000 ft. wall near Washington Pass, there is a growing chorus of climbers that say it is the finest climb in the state. 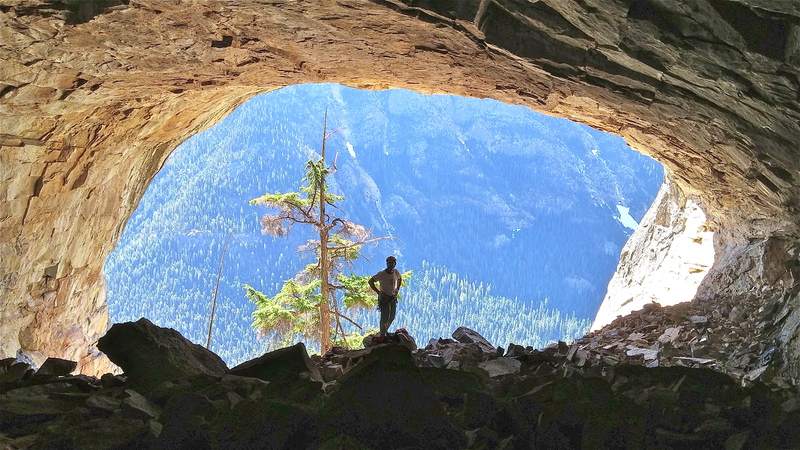 Yes, the whole climbing package is astounding, but how often do we get to try a tough climb that has an enormous cave in the middle of it? 1st attempt was last year with Paul. after mistakenly going way past the start of the route up the approach gully, we bailed disgusted with how involved and somewhat dangerous the approach appeared. 2nd attempt was done early in the snow year to try to avoid the bad slabs by walking atop the snowpack instead. The only problem with that notion was that Jon and I found the upper part of the route to be very wet- april 19th , lesson learned. Attempt# 3 just happened June 7 of 2015, and it was just dry enough to climb it. We knew heat was going to be an issue on the South-facing wall so we left the car at 4am! We swapped the lead order and that left me leading the money pitch (p2) which is quite a pitch. The pitches(2-5) are strenuous and make tough onsights. Pitch 3: The Arch is amazing, P4 the crux was 1 of 2 pitches that we couldn’t get clean. The cave of course is just crazy, as is the pitch to get out of it! I’m pretty sure a pterodactyl used to live in that cave. Bring long runners, patience, and fitness, Know that there are stances between tough moves and fair grades. Have a blast on Supercave, it lives up to the hype!